Tiny Pineapple // Be Honest With Yourself: No, Thank You! Be Honest With Yourself: No, Thank You! How should you answer the person who invites you to “take a cigarette” or “have a drink” — or do anything which is against your conscience or contrary to the teachings of your Heavenly Father? What should you say? How much do you need to explain or apologize? When, if ever, should you compromise just a little for the sake of appearance? The answer is easy. 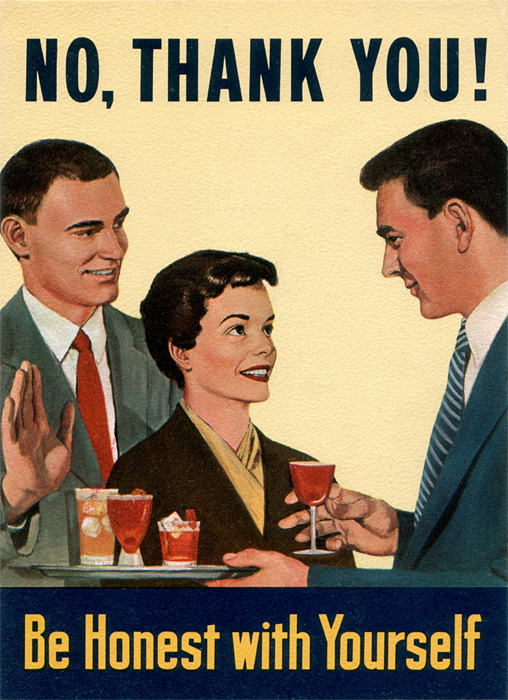 Just say “No — no, thank you.” Don’t waver. Don’t worry about how others may think or act. Be your own natural, honest self. Everyone admires sincerity. If the invitation to indulge in something you don’t believe in comes from a host or hostess while you are a guest, your answer will come even easier. The obligation of courtesy is not that of the guest but of the host. The gracious host will never press you, never question your right to be yourself in matters of conscience. He will admire you for your forthright stand. It’s natural to want to be liked by the crowd. But compromising with principles is always wrong, often dangerous.